An artist's depiction of the proposed Dragonfly spacecraft on the surface of Titan. Knowledge of those Titan traits comes primarily from data gathered by the Cassini mission to the Saturn system and the Huygens probe that traveled with Cassini and touched down on Titan in 2005. Taken together, those two spacecraft completely reshaped scientists' ideas about the moon. "We didn't know how Titan worked as a system before Cassini got there. We had tantalizing hints, but Cassini and Huygens really took it from [being] this mysterious moon to [being] a place that is incredibly familiar," Elizabeth "Zibi" Turtle, principal investigator for Dragonfly and a planetary scientist at the Johns Hopkins University Applied Physics Laboratory, told Space.com. "Cassini really showed us Titan as a world and how it works and the different processes that are acting on it." An artist's depiction shows each stage of the proposed Dragonfly mission, including landing on Titan's surface, doing science in place and relocating to a new work site. But Cassini never got a good view of the surface through the moon's thick atmosphere, and once the Huygens probe touched down, it ran out of battery power in mere hours. If all goes smoothly, Dragonfly would be able to explore dozens of sites over the course of two Earth years. And some aspects of the proposed mission aren't as difficult as you might expect. Consider landing, for example. Trainer, who also works with the Curiosity rover on Mars, remembers well the so-called "7 minutes of terror" during that rover's action-packed landing, as the spacecraft fought to slow itself quickly enough to touch down gently. "Compared to that, landing on Titan is just this leisurely, gentle float down to the surface," she said. "It takes something like over 2 hours because of this dense atmosphere." That atmosphere, which Trainer compared to a pillow, combined with the low gravity on the moon (about a seventh the strength of Earth's) also makes putting an aircraft on a distant moon much more feasible. With its rotor-copter design, Dragonfly can lift itself off the surface and fly away using the nuclear power source that NASA had available for this class of mission. That science will tackle the chemistry on Titan. Scientists know that the moon hosts huge amounts of organic compounds, but Cassini and Huygens didn't gather enough data to clarify the details of the planet's chemistry. Dragonfly would be able to identify precise organic compounds, so scientists could determine just how close Titan's molecules are to those that terrestrial biology relies on. Data from the Cassini mission to Saturn show a large lake on Titan's surface. Liquid on the moon's surface is predominantly organic compounds like methane (shown in black here); the solid surface is made of water ice (shown in gold here). "Dragonfly is first and foremost a mission to understand prebiotic chemistry. What happened to get from chemistry to biology?" Turtle said. "Of course, we can't study that on Earth, because biology has kind of overprinted everything, but Titan is actually the place that is most like the early Earth in the solar system." Scientists have run experiments to try to mimic Titan in the laboratory, testing what compounds the ingredients and conditions they replicate produce. Those experiments have had intriguing results — the reactions can create amino acids, for example, the building blocks of proteins — but they can never run indefinitely. "In the laboratory, you're always limited by time. Titan has been doing this for millions and millions of years," Trainer said. "Titan has basically been doing these experiments for us, and all we're trying to do is go and get the results." 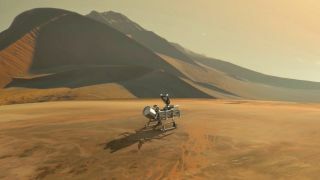 And if the mission's impetus comes from the Cassini and Huygens missions, the methodology to fetch those results is inspired by a very different suite of spacecraft: NASA's Mars rovers. After all, Titan isn't the first place NASA has studied organic compounds; that's precisely what the Curiosity rover was designed to do. So, Dragonfly would carry some of the same instruments adapted for a new context. Whether Dragonfly takes flight is now up to NASA. The Dragonfly team submitted a detailed concept report in December and is expecting a decision from the agency this summer. The team members said they think they've made a compelling case for both the science that the mission could do and its feasibility. "It's amazing, but it's not crazy," Trainer said.